Sri Gnanananda Giri was a contemporary of Sri Ramana Maharshi, and another Advaita Vedanta jivanmukhti living near Arunachala. When we took our recent trip to Tirukkoyilur, we stopped by Sri Gnanananda’s ashram, Thapovanam (sometime spelled Dhabovanam). We had not heard of him before this visit to his ashram. In some ways, it is like Sri Ramanasramam, with devotees living at the ashram, and the daily performance of pujas, chanting and worship. 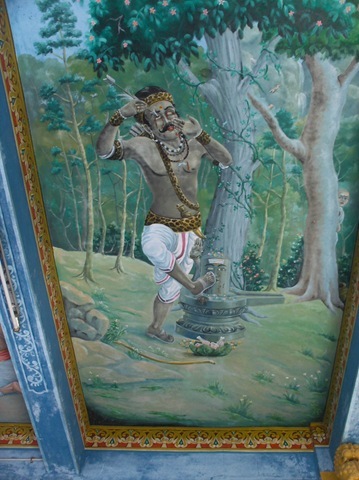 He is said to have visited Ramana during the Virupaksha days. As I have researched Sri Gnanananda, he does seem remarkable. His mahasamadhi was in 1974. They have no idea when he was born. It is said to be in the 1700s or early in 1800, and that he was perhaps 250 years old at the time of mahasamadhi (see this post). No one knows the story of his early life, prior to Self-realization. He said basically that this is an unreal story of an unreal person, so of what use is such a story? This is exactly what I had heard from my teacher, Nome, so I appreciate the point of view. He wandered for many years throughout India, established, then left, a number of ashrams, and finally settled in Tirukkoyilur, because of the spiritual power he perceived in this place. He had close contact with spiritual gurus such as Ramana Maharshi , Ramakrishna Paramahamsa, Aurobindo, Seshadri Swami, Vallalar, Shudhananda Bharati and Yogi Ramsuratkumar. It is believed that that Swami Gnanananda was born long ago at Mangalapuri in the North Kanara district to an orthodox Brahmin couple Sri Venkoba Ganapatigal and Smt. 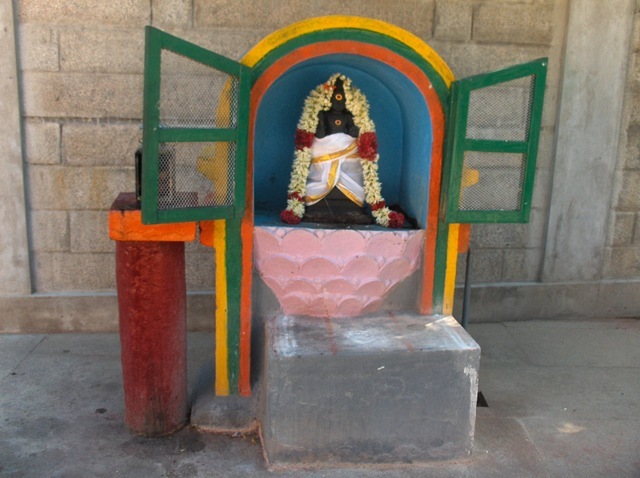 Sakkubai. The child was named as Subramanya. At his young age Subramanya did not show interest in formal education. He was indifferent to external things of life and deeply absorbed in knowing thy self. At the age of 12 Subramanya followed a divine light and reached Pandharpur. 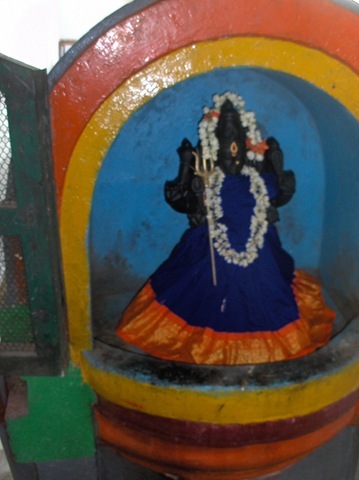 There, he had a divine darshan of Lord Panduranga and-Rukmayi. It is in this place boy met his Guru, Swami Sivaratna Giri of Jyotirmutt, one of the four mutts established by saint Adi Sankara. After Mahasamadhi of his Guru, Swami Gnanananda Giri became the peetathipathi of Jyotir Mutt (one of the four mutts founded by Adi Sankara). 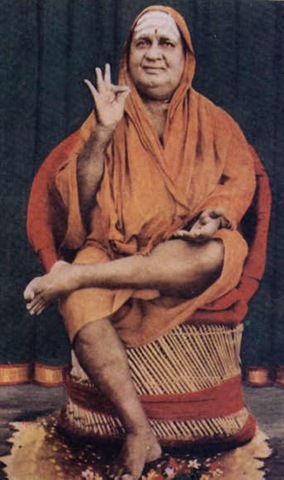 Swamiji did not show any interest in Peeta and nominated Swami Ananda Giri as his successor, and started out to the high Himalayas for undertaking intense penance. Swami Gnanananda wandered high into the snow-covered mountains of Kashmir, Nepal and all over the Himalayan range and met several yogis. The sages of Himalayas performed rare kayakalp treatment on him and inserted special herb in to a vein of his forearm. It is the obsolete method of preserving the body in health and vigor for more than 100 years for performing extreme spiritual penance in harsh climatic conditions at higher altitudes. After long period of spiritual discipline, meditation and Samadhi, swami Gnanananda traveled extensively on foot, spanning the whole of India, Tibet, Nepal, Burma and Sri Lanka. 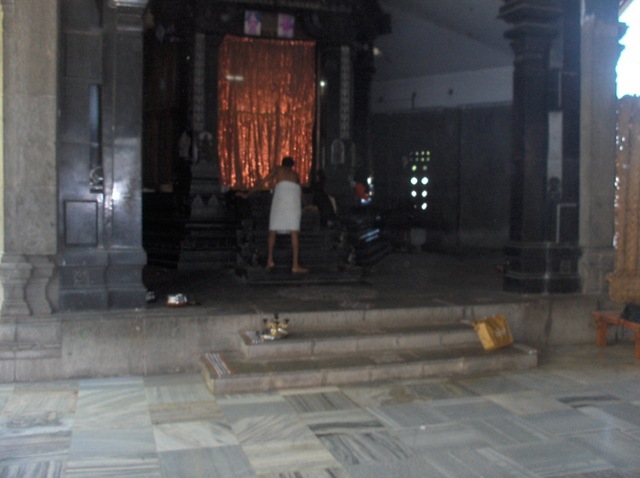 He stayed in the famous Shri Lankan Shrine of Kathirgamam for 60 years. In Tamilnadu itself the sage had stayed for more than a hundred and seventy years in various places – Kalpattu, Kolli Malai hills, Polur etc. For those ready to plunge into the deepest practice, he taught that dhyana (meditation) was what is needed, and that all other forms like karma yoga, bhakta yoga, chanting, austerities, etc. are not only not needed but can get in the way of deep practice. For those not ready to plunge in, he taught to follow the traditional practices to ready the mind for practice. 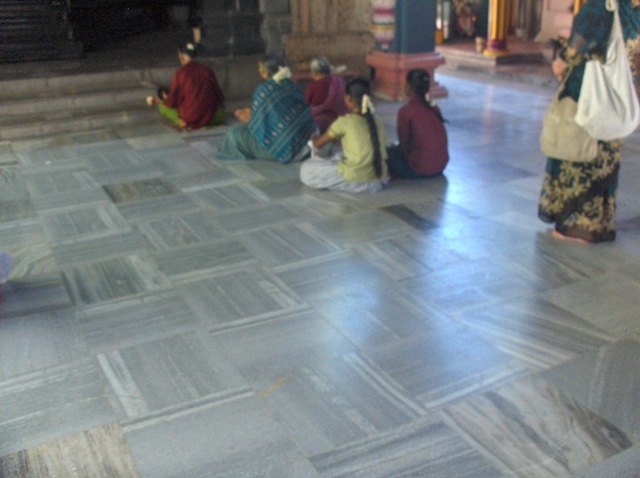 At Thapovanam, the traditional practices and rituals are done every day. The swami never bothered about the status of a person. The swami had a very nice way of deflating people’s ego, so that the self may be renounced. Indeed there is no other way of describing the personality of the swami than by calling Him a “Paramananda Vigraham”. Swami’s simplicity, sweet amiability and his knack of being at home with everyone he talked to, be he a saint or sinner, merits special mention. Anyone meeting him for the first time would feel completely at ease. The swami was first and foremost a paramahamsa parivrajaka, a true wandering monk without belongings or obligations. He exemplified in himself that spontaneous love of insecurity and anonymity which is the hallmark of a genuine sannyasin. He moved away as disciples built ashrams for him. It was only towards the end of his phenomenally long spiritual ministry that he settled down at Thapovanam on the outskirts of the ancient temple town of Tirukkoyilur on the banks of a sacred river and within the spiritual aura of Arunachala. It was at Thapovanam in December 1955 that Swami Abhishiktananda met Sri Gnanananda. As you know, the former was Fr. Henri Le Saux, a Benedictine monk from the monastery of Kergonan in France. He, together with Fr. Jules Monchanin, founded a Christian ashram at Shantivanam, Kulitalai, near Trichy in Tamil Nadu. He was already acquainted with the teachings of Bhagawan Sri Ramana Maharshi, the Sage of Arunachala, and of the Upanishads, and was attracted to the caves of Arunachala at Tiruvannamalai. Sri Gnanananda also made a very deep impression on him. He writes: “Sri Gnanananda refused all cheap spirituality. His teaching is fundamentally the way of total renunciation so that finally there is no ego left to manifest itself. May the sceptic try the way of Dhyana, which he taught!” His teachings are the same as that of the Upanishads. Behind the appearance of the veil of the empirical and phenomenal ego is the Ultimate Reality, which could also be called the Immortal Self of All, which is the same as God in the absolute transcendence as Godhead. The Ultimate cannot be an object of knowledge or experience. One has to be It and that is the only way of knowing It. Being is Knowing. So, the Knower of Brahman, the Godhead, is the Brahman Itself, proclaim the scriptures. The external guru with the form is gurumurti, who, having realized Atman, the Self, shows the way. He makes the disciple take the high dive and reveals his true form as the inner guru, the Atman, ‘I AM’, who is akhanda, undivided, and advaitic, nondual. Gnanananda again and again tells Abhishiktananda that guru darshana is the direct and immediate realization of Atman, the Self, ‘I AM’. We visited this Ashram during a recent trip to Tirukkoyilur, and took the photos below. Here is their map, showing the location of the Ashram. Note that the map has North pointing DOWN, not up. 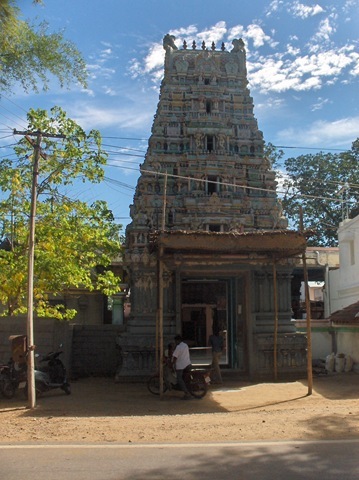 It has a five-tier gopuram that faces the road. If motoring in from Tiruvannamalai, this is to the left, just when the town area begins, after a long stretch of road through the countryside. 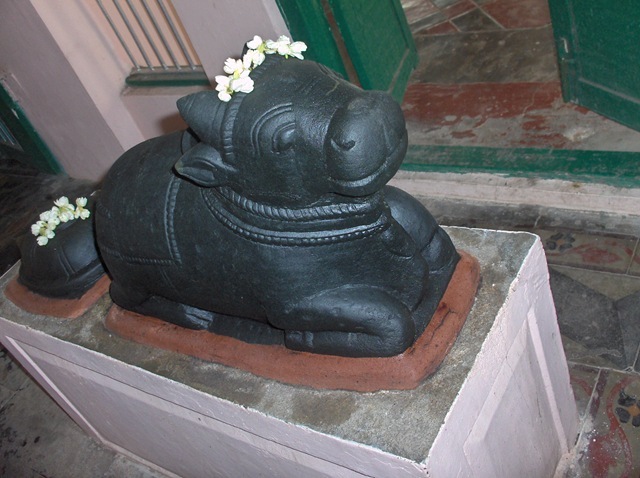 Just inside the entrance, to the left, is Sri Gnanananda’s samadhi. It is about 9:00 in the morning, and the curtain has not yet been raised. It will be opened soon. To the right of the entrance is a long hall. 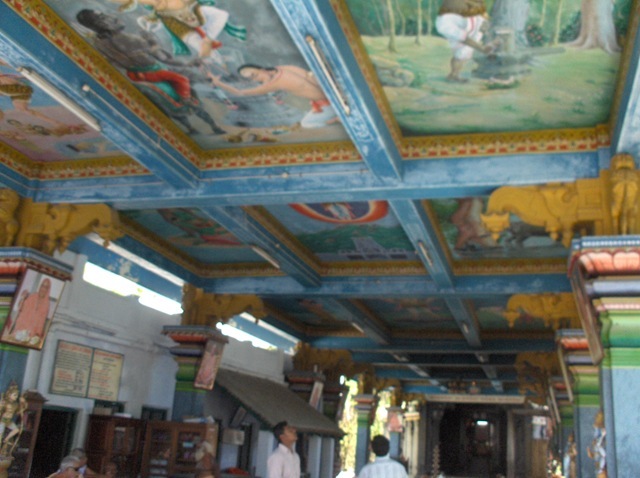 As we will see later, the ceiling has many paintings from Hindu and Vedic lore. Just past the samadhi is Krishna. Puja was going on for Krishna. There are two Krishnas here, with a smaller on in front. They are wonderfully decorated and dressed. A procession walks through the grounds, headed, I think, for the samadhi. 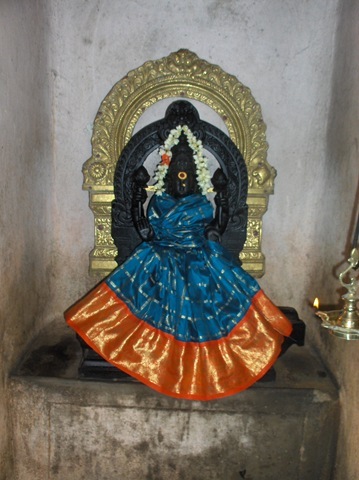 Swami built temples for the deities of GnanaGanesa, GnanaSkanda, GnanaPurisa, GnanaAmbika, GnanaMahalakshmi, GnanaVenugopala, GnanaAnjayeya, GnanaBairava, Durga, Navagraha and Chandikeshwara. The deities were given chaitanya (power) by Swami through his graceful look and sankalpa, and the deities today shower their “anugraha” to all those devotees who pray and surrender. We found that the deities here are very well taken care of and decorated. Each day they receive loving care. There is a central building in which most of the deities are housed. 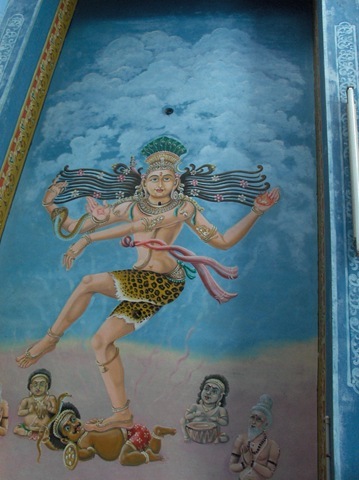 Here is Nataraja, Siva as the cosmic dancer who performs his divine dance to destroy a weary universe and make preparations for god Brahma to start the process of creation. Here is someone with his two consorts. Anyone know which god this is? This murti is about two feet high. Who is he? Here is Durga’s vahana, a lion. 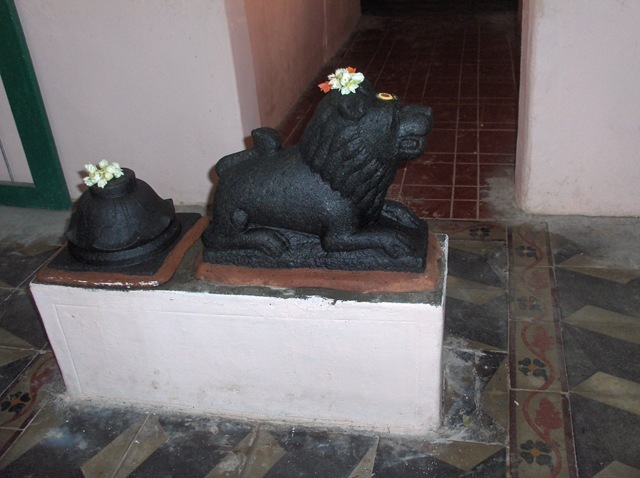 At the entrance into the main shrine are these two representations of Sri Gnanananda. One is cut out so it looks like swami is meditating with us. 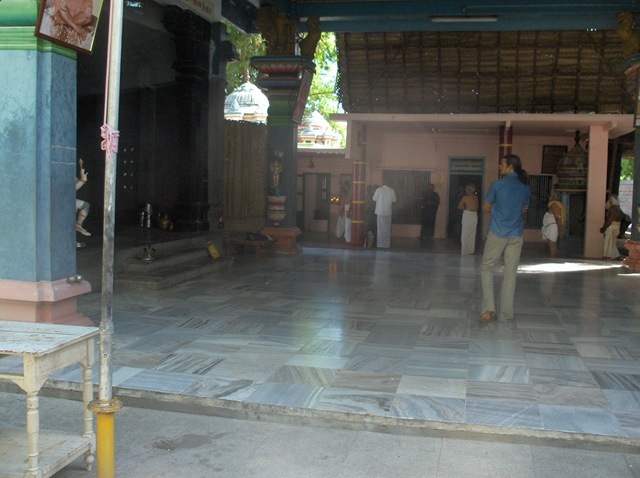 In the main shrine are Ganesh and Murgan. I cannot take their photos, but they let me shoot their vahanas. Now at the samadhi, puja has been done and a group of women sit in front singing. This reminds me of Ramanasramam. The same love and care, just fewer people. Now we start walking through the hall with all the painted panels. Not sure of this figure. 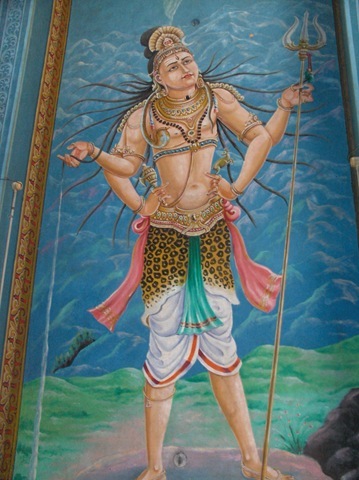 He carries a trident (trishul), so I guess it is Siva. Here is Arunachala, with the column of fire. 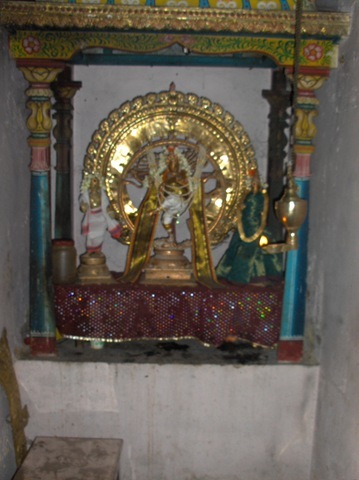 Nataraja. We all wait for the foot to be lowered. This is Bhakta Kannappa, one of the 63 Tamil Nayanmars. 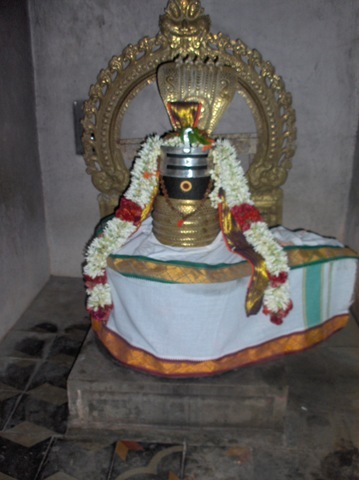 He is cutting out his eyes, so that he can give them to Siva in the form of this lingam. He is a hunter and has offered the lingam meat! Arjuna feels very powerful after Kurukshtra war, when he vanquished Kaurava army with the help of Sri Krishna. He conveniently forgets that the Pandava revival began as soon as he earns Paasupatastram from Lord Shiva. If you chronicle the events from that point onwards in Mahabharata, you will find that Pandavas were on the ascendancy. Lord Shiva and Parvati decide to provide a re-birth for Arjuna, with the hope that he would realize the power of Lord Shiva. 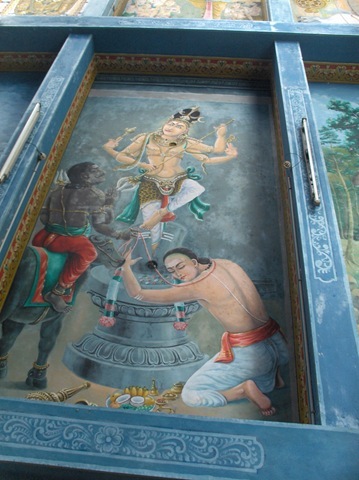 Arjuna takes re-birth and was left to be found by a tribal Chief, who names him as Kannappa. The boy hates sacrifices in the name of Goddess [who is believed to protect the Bhil tribe] and does not worship her. The Chief’s daughter falls in love with Kannappa, but she propitiates Parvati. Kannappa marries her, but has to leave the tribe as he does not believe in the Goddess. Kannappa questions his wife’s faith in Shiva, until he encounters Lord Shiva. Arjuna’s aatma will be carrying ahankara until this point of time. He then realizes the power of Lord Shiva and seeks to propitiate him with the stuff he finds while hunting animals. 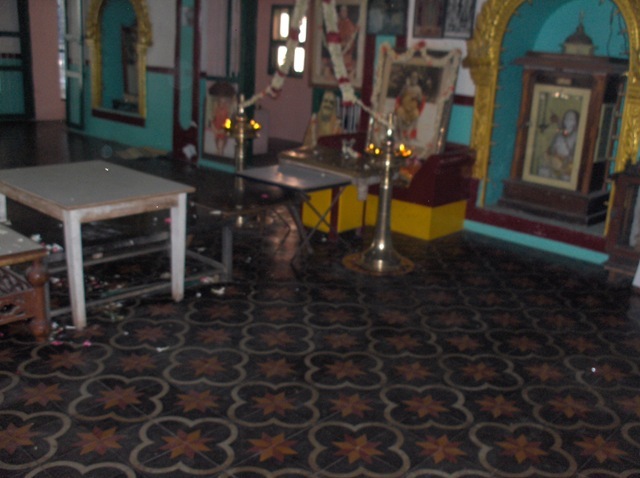 The local head Archaka does not like his defiling the sanctum sanctorum of Sri Kalahasti Shiva temple and frames Kannappa for jewel theft. Lord Shiva feels sad, as Parvati questions his helplessness. 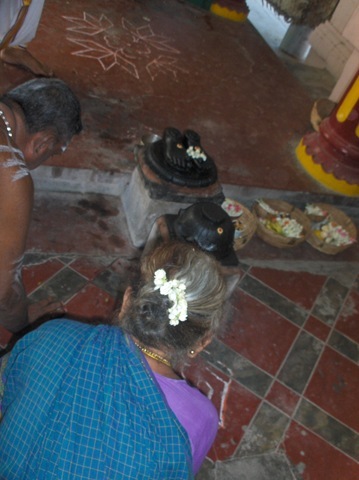 As a result, the Shiva Lingam sheds tears of blood from both eyes……. Kannappa vows to end the blood flow and he gouges his own eyes one by one, hoping to provide eyes to Lord Shiva, to the amazement of all the priests. Lord Shiva is pleased with Kannappa’s effort, appears before him, reminds him of his past, reminds the World that he is a great jnaani, appreciates his big heart and provides the couple with moksha. Anyone learning about this story is blessed to cleanse their inner thought process and is expected to realize their true potential. 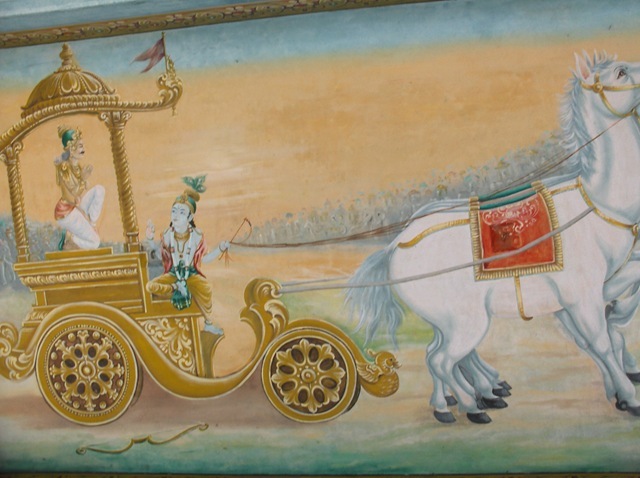 Arjuna with his chariot and Krishna as the driver. 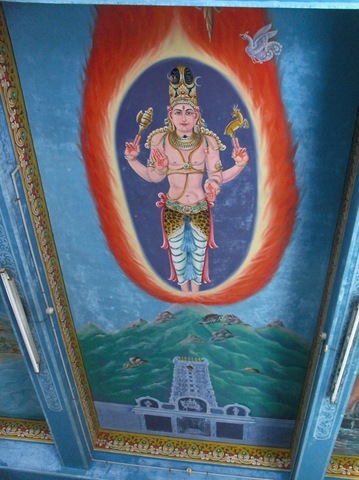 Vishnu with one leg raised to the heavens. 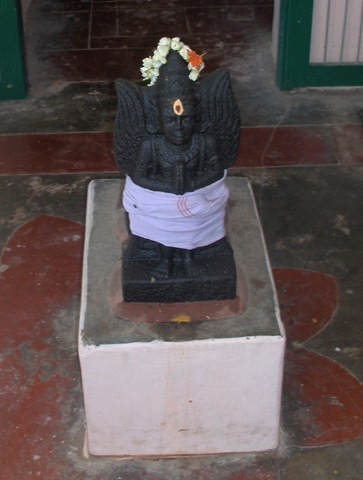 This is a form of Vishnu worshiped in the nearby Vishnu temple. 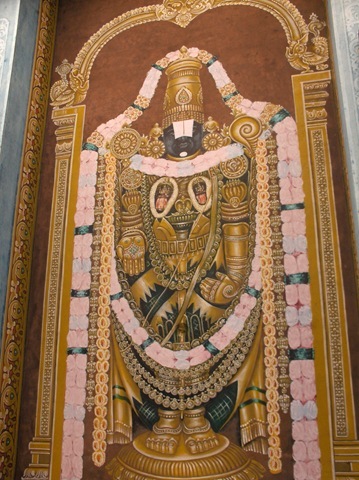 Balaji, an avatar of Vishnu. Here is another murti of Sri Gnanananda. Commemorative plaque, saying that much work has been done, including these great paintings. 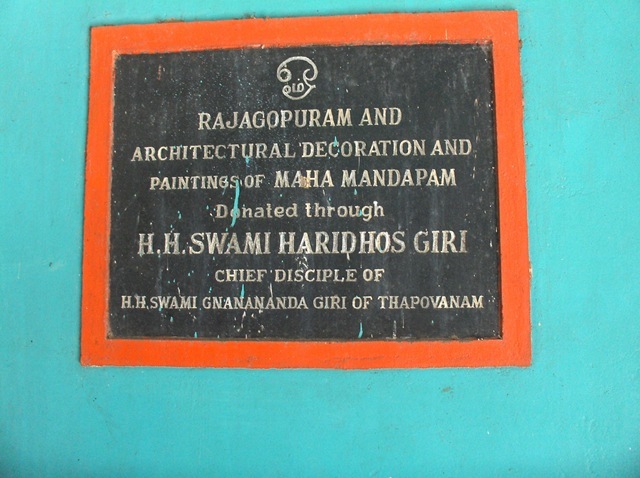 This was done by Swami Haridhos Giri, the chief disciple of Swami Gnanananda Giri. Thapovanam was not a place we expected to go, and Sri Gnanananda Giri was not anyone we knew of. After visiting the ashram, and feeling a deep sense of peace from it, and researching the Swami, we now recognize this ashram as celebrating yet another contemporary of Ramana Maharshi, less well known, but teaching the same deep thread of Advaita Vedanta. There is only one Truth. There are many gateways to this Truth. This entry was posted on June 22, 2009 at 2:40 pm and is filed under Arunachala, Ramana Maharshi, Spirituality, Tamil Nadu, Temples, Shrines and Ashrams, Tiruvannamalai. You can follow any responses to this entry through the RSS 2.0 feed. You can leave a response, or trackback from your own site. I WANT TO VISIT TAPOVAN. I LIVE IN DELHI. I SEEK HELP FROM SOME BODY WHO MAY ADVISE ME GOING ABOUT MY TRIP. HOW MANY DAYS TO STAY IN TAPOVANAM. hE IS A PAID GUIDE. please do not take advantage of him. Mr. Kalyan Sundaram, its very easy to reach Thapovanam. First you need sathguru’s grace and blessings to go to thapovanam. I think you have already got his grace, that’s why you planning to visit. Let me help you to reach thapovanam. Its my duty to take you to this holy place. Transport: You can choose your own transport from Delhi to Chennai, Tamil nadu. From Chennai you can arrange car as own, or you take bus to Thirukoilur from chennai CMBT Bus stand. You can stay there for 2-3 days. Many things to share about Ashram. You can contact me thru mobile +91-99650 66994.
this is so nice to read life history of Great Saint. The previous link contains a playlist. The correct video (part 4) is in this link. I just found a youtube video that has the real voice of Gnananda explaining that he used to visit Arunachala Maharishi (Ramana) during the nights (11 PM or 1 AM) and discuss with him. He mentions that Ramana would just speak very briefly. He also mentions other technical terms which I don’t really understand..But he talks about self-enquiry. He also speaks that both of them would meet in the mystic space (He uses the tamil word “ooduruvi” which means something like enter the spiritual realm..). Although this is in Tamil, you can try and figure out or get help from someone who knows Tamil. also have u been to thapovanam? do u live in india? i go to ramana ashram here in my city and i love it….i also got o aurobindo ashram. have u heard of it… thapovanam, ramana n the mother from aurobindo ashram are my faourites!! Yes, been to Thapovanam and liked it very much. Long time practitioner of Sri Ramana’s self-inqiry, had most excellent teacher in the USA< Nome at SAT in Santa Crux CA, http://www.satramana.org, live in Tiruvannamalai near Ramanasramam, three years now, sometimes go to POndy and to Aurbindo ashram, love meditating near the Mother's shrine. 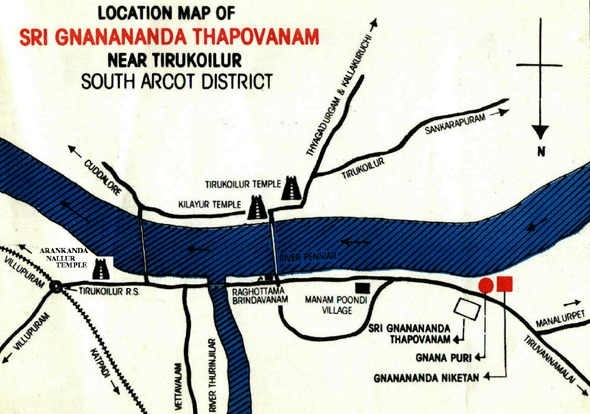 was lovely to read this blog… my family has been goin to thapovanam for 60 yrs now…my grandpa knew ganananda very well n i have been goin there from when i was a child…i would be happy to help anyone who would want to go there or need any information. can i have ur email id? also im sure u will know so much about the place but if u need help i can help u.. my dad is also a big devotee of ramana ashram. i am vert devoted to thapovanam. i love that place… its soo calm peaceful and there is a magical touch to that place. talk to u soon. pls can i have ur email id? Thank you for all the information about Gnanananda and people who knew him. This can be good for anyone interested in him. I am excited to share what I know, as my complete family descend happen to be devotees of Sri Gnanananda Giri Swamigal. In Gnanananda Thapovanam, they prefer a simple living and perform regular routines with utmost involvement, dedication, love and care for Swami. I have always felt a inner peace everytime I visit there. My children also like the place for its immense peace and country surroundings. 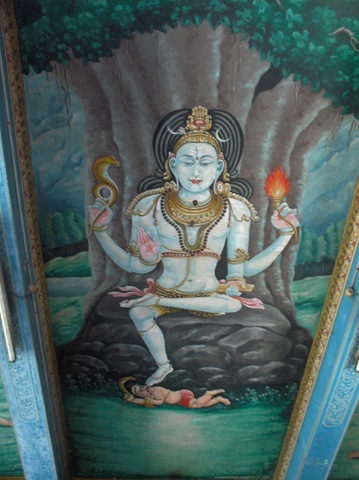 You should try to meet Namaji who lives in Tapovanam. Ask for him; His cottage is opposite to temple. Also if you meet Sakunthala Mami (old lady who sings Bhajans), she will give you some pointers. Also there is a old person by name Kailasa Gurukkal. 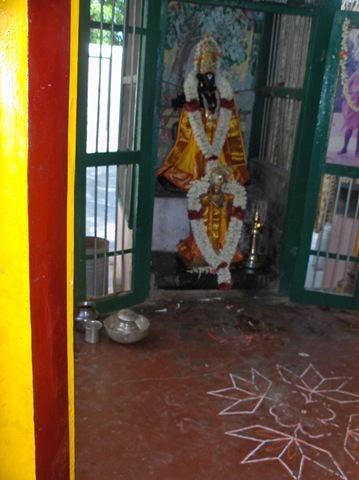 My grandfather, Gnanananda Swamigal & Kailasa Gurukkal are responsible for establishing the first deity in Thapovanam. So you can try your best to meet this old person. My grandfather is no more anyway. Also if you visit nearby Siddhilinga madam, this is the place Swami came and stayed originally with all the big, long hair etc., when he came from Himalayas. Siddhilinga madam is a small village again, but near to Tapovanam and can be reached quicker by car. When you get to Siddhilinga madam, try to find a school called Vivekananda (I think that’s the name). Ask for Pitchai pillai, who runs the school. Their family (atleast his mother I know for sure) has met Swami from those olden times. Hopefully all these links + some book resources inside Gnanananda Ashram (or) books from Namaji should help. 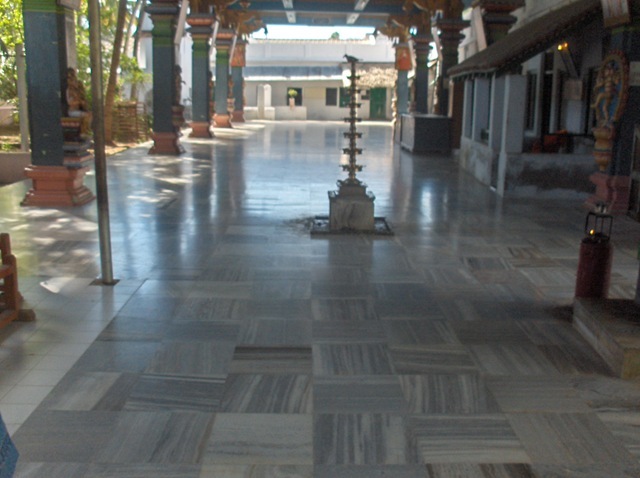 There is also this place called “Thennangur” established by Swami Haridhas Giri, disciple of Swami Gnanananda. You can try for good books there, as there is a beautiful Krishna-Rukmayi temple there. Please look at this site for more info about Sri Gnanananda. 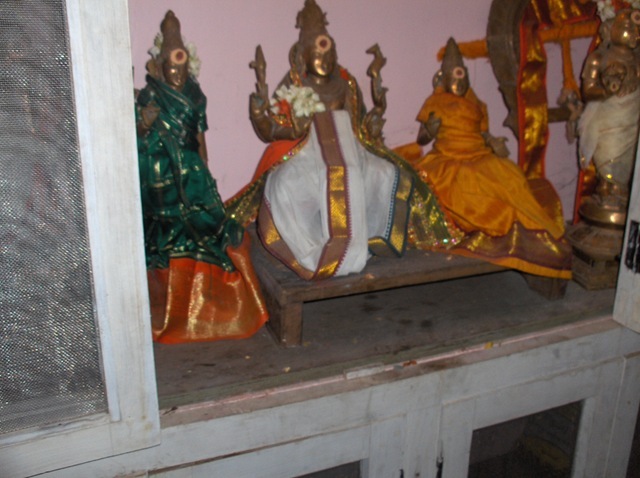 There is a list of sanyasins of Tapovanam in the left panel. Swami Nitayanandagiri lives at Tapovanam and would be a good source of information about Sri Ramana and Sri Gnanananda. Please do meet him when you visit Tapovanam next. There is mention about Gurunathar’s interaction with renowned Saints, but not much detail about Sri Ramana. It is very nice to see your informative article and the pictures posted. I would suggest reading a very nice book titled “The Guru and His Disciple” by “Namaji “published in English by “Sri Gnanananda Seva Samajam”, Chennai -600028. This book is also available in name of “Gnananubhuvam”. To quote a few ,In chapter 38 “A Great Saint among Saints”, pg 131 of this book, Gurunathar’s interaction with other sages is cleraly narrated with available photographs. There is also another book published in english (I.S.P.C.K, post box 1585,Kashemer Gate, Delhi 110006) titled “Guru and Disciple”, by Abhishiktananda , which describes a n encounter with SRI GNANANANDA, a contemporary spiritual master. Thank you for the reference. Does this book talk about his relationship with Sri Ramana? Yes here are writings/speeches describing the discussions between Sadguru Gnananandha and Shri Ramana Maharishi. I remember one such discussion was during the night time about Sushupthi(Deep Sleep State). This state was enjoyed by every soul but unconscious to mortals and conscious to Immortals. I will locate that sppech/article and share with you in much detail. Thank you for the comments and information about Swami Gnanaabnda. I am very interested in dialogs he had with Sri Ramana. Posting them would be a great service to all. Just like to share few that I heard from speeches of Sadguru Shri Haridhos Giri (Guruji) and Namaji about The great master of masters – Sadguru Shri Gnananandha Giri. Shri Gnananandha Sadguru’s Ayonija (meaning one who born not from a (human) womb or people with extra ordinary origins) apperance in human form is certainly very very long ago and goes back more than 2000+ years. 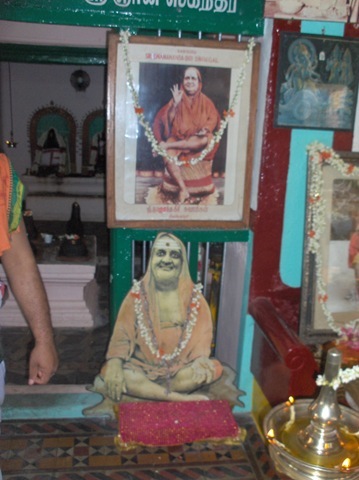 He is the Sixth Pontiff of the Jyothir Mutt(University of Light) in Srinagar(moved to Badrinath in 19th century) Kashmir, One of four establishments by Jagadguru Adi Shankara (509–477 BC). Its at this University Jesus studies during much later years. Sadguru became the Pontiff of Mutt after directions from master Sadguru Shri Shivaratna Giri, 5th Pontiff of Jyothir Mutt, 200-100BC. After Sadguru Shri Shivaratna giri decided to ascend into Samadhi, whose Jeeva Samadhi is in Srinagar, Kashmir, Sadguru Gnananandha couldn’t bear the separation from his master and decided to renounce from the Pontiff position and set out for greater enlightenment. Ever since he has meditated in Manasarovar, near Mt Kailash(now in Tibet), for several centuries. His hair-lock grows so long that it crawls over the ground as he walks, He had shaven off such long grown hair for many numerous times. 🙂 Sixty year is a standard time frame for Him to complete one sitting of meditation. In 21th century discussions, Namaji used to say that Sadguru Gnananandha hardly breaths meaning his breath cycle is so slow and close to stillness. When one’s mind whose quest to observe ceases/refuses the act of observation, time ceases to exist, body(energy field) instantly reacts to this information and does everything to sustain it.Sadguru’s long journey continues for centuries and will be continue for ever as universe exist. 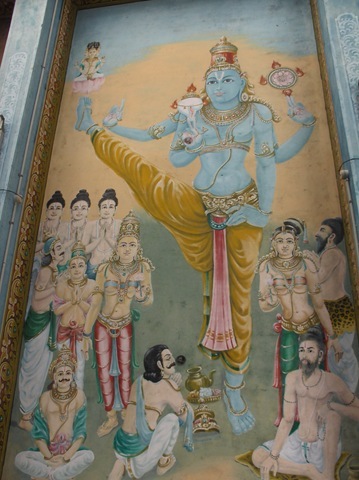 Early in 19th century Sadguru Gnananandha began his tapas in now called Batu Caves, Kaulalampur, Malaysia. This penance continued until 1864 when Divine Manifestation of Lord Skanda happened before Sadguru. Out of This Divine Grace, Compassion, this spot is now a massive spiritual spot in world. Further Sadguru loved on his journey along the Himalayas down towards the equator crossing the straits to Singapore and Sumatra. To many Indonesian brothers of Islamic faith Sadguru is the Prophet who spoke through Q’uran. Thus after a long journey before the first world war began He entered Srilanka via a merchant ship. Over there He blessed the Zen meditation techniques to many seekers of Buddhist lineage. By this time 12 out of 13 monks who accompanied Sadguru all along the Himalayan journey from Kashmir> Kailash > Nepal > Bhutan >Bengal> Assam > Mizoram> Burma>Thailand>Malaya>Singapore > Indonesia. 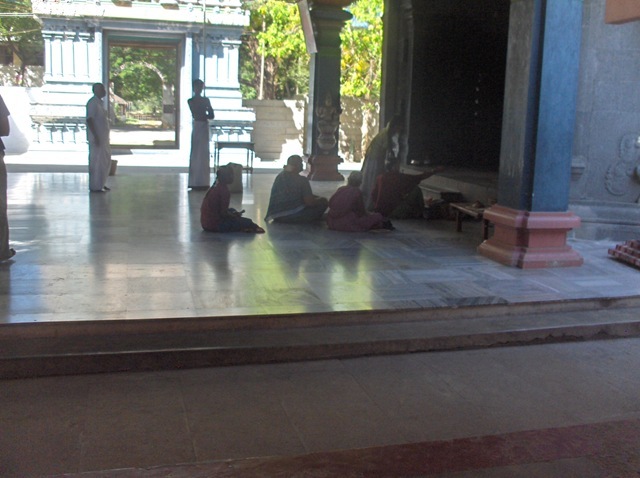 12 Monks ascended Samadhi in and around kadhir Gramam, Srilanka and Swami entered into Tamilnadu, India along with the another one old monk of Himalayan journey. There after He Sadguru had met numerous Saints across Southern India. Shri Ramana Maharishi, Shri Aurobindo, Shri Subramanya Bharathi, Shri Mother of Auroville, Shri Yogi Ram Surat Kumarar, Shiridi Sai Baba, Shri Sathya Sai Baba(during 1950’s) and many many more. Sadguru has told that at any point of time there will be 20 million Sadhus(Saints, Sants, Sages, Maharishis, Bhagavathas) will be living in world and half of them will be in South India alone. I have been to Thapovanam many times. 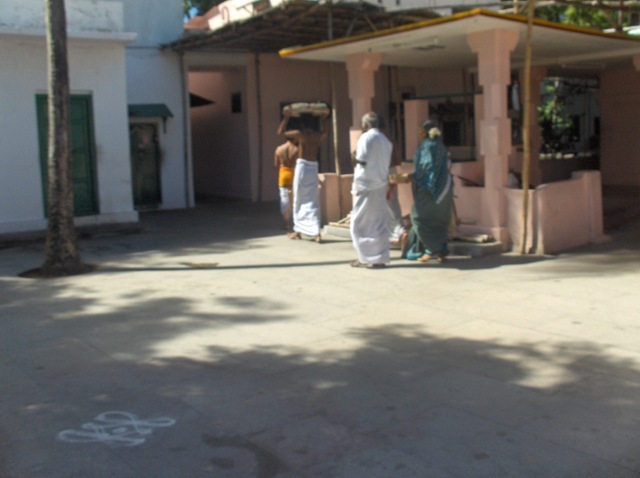 My grand parents lived in Thapovanam ashram for many years. Now it long since i had been there. i have seen Guru, Swami Gnanananda Giri and had his blessing. One should visit this place to feel and experience oneself. Thank you for your comment. We are very interested in Swami Gnanananda Giri and will certainly go back to Thapovanam. You a re blesssed to have your parents live there and for you to have his blessing. We have heard the me met Ramana Maharshi. Do you know anything of this? I am sorry I don’t remember where I read it. But all I remember was that their interaction was several short durations where Gnananandagiri swami met Ramana and discussed about Samadhi.. As there was no one with Ramana at that time, these were not documented unlike the later days when Devaraja mudaliar and others were around. 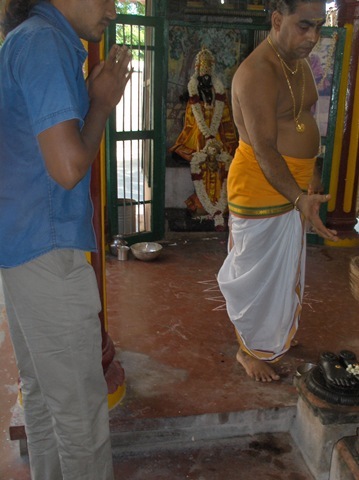 But trying at the Thapovanam might help. I think that the Thapovanam has a good library. It is likely to have been written by a devotee who lived during the time when both of these mahatmas were alive. I will let you know if I find the exact document. I will go to Thapovanam and see what I can learn. Thanks. 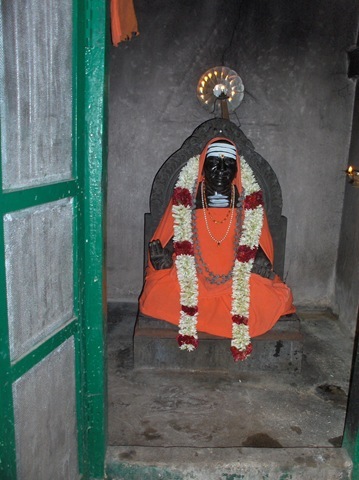 There are numerous incidents in Sri Gnananadagiri swamigal’s life that also show that he was a real siddhapurusha. His interactions with Ramana and Sri Kanchi Mahaswami are memorable. Do you know where I can find any of these stories of his interactions with Ramana? Richard, nice article. only recently i heard about Gnanananda’s Thapovanam ashram. if i remember correctly, it was mentioned in the book Only God, a biography of Ram Surat Kumar, another enlightened master from Tiruvannamalai. Ram Surat Kumar was a contemporary of Ramana Maharshi. 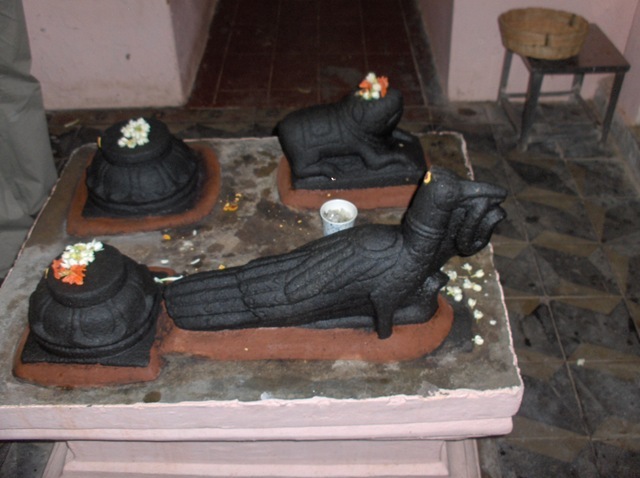 the 2 feet high murti is Garuda, the vahana/vehicle of Lord Vishnu. thanks again – and looking forward to many more postings. Thanks a lot for this article. I came to know first time about Gnanananda Giri garu. Thank you so much Richard Clark.